If you, like me, are waiting for your BTO to be completed, I strongly encourage you to try searching for any Facebook group that may be set up for your estate. We’re only collecting keys in September / October but we’ve already started interacting with our neighbours through a closed Facebook group. 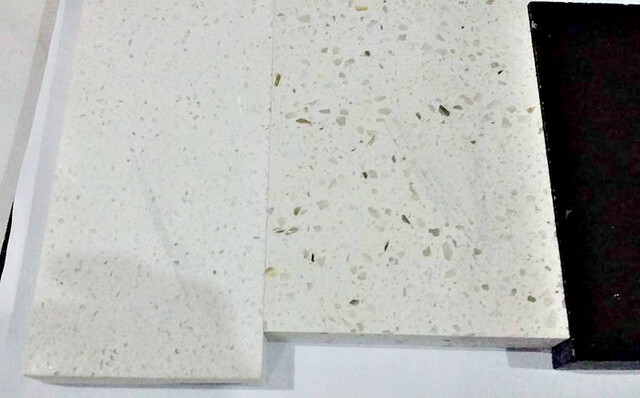 Especially in the last few months, we’ve been sharing thoughts and tips on renovation, one of the things that came up was the topic of kitchen countertop. 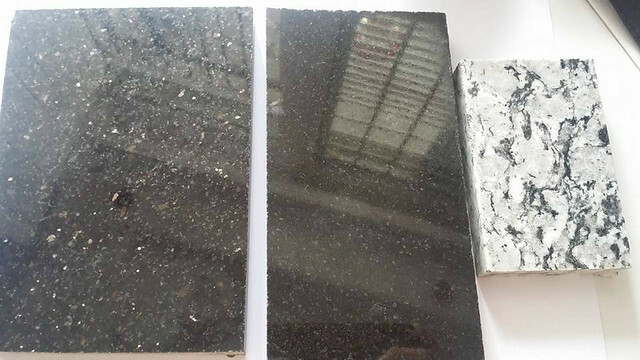 My neighbour, Carol, abused samples of quartz and granite countertop materials to share the outcome and, with her permission, I’m sharing it here with you. 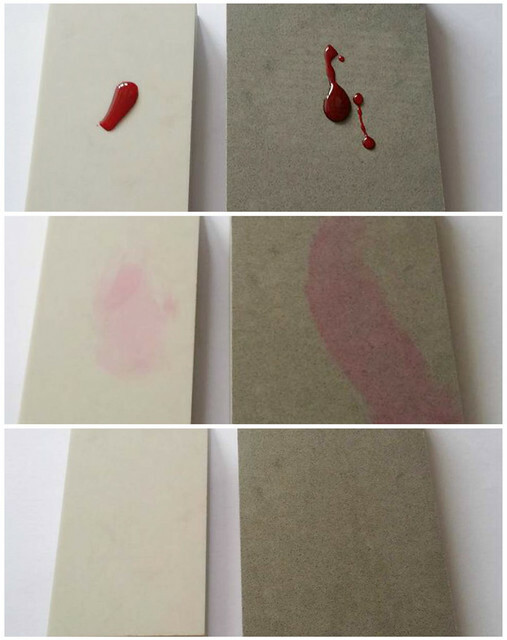 For this test, red food dye was left on for 10 minutes, before wiping off and subsequently cleaning off with regular detergent soap. 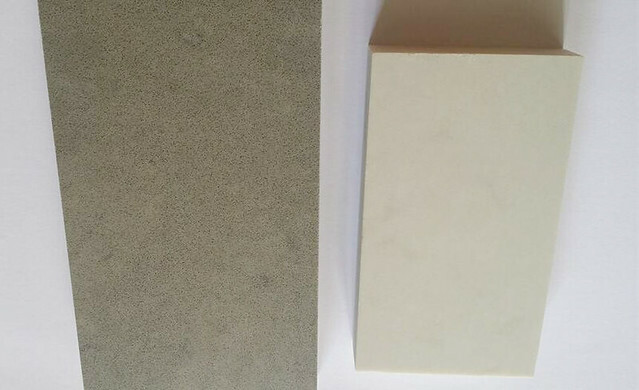 The result is no staining on all materials, other than about 1% staining on the light coloured granite. 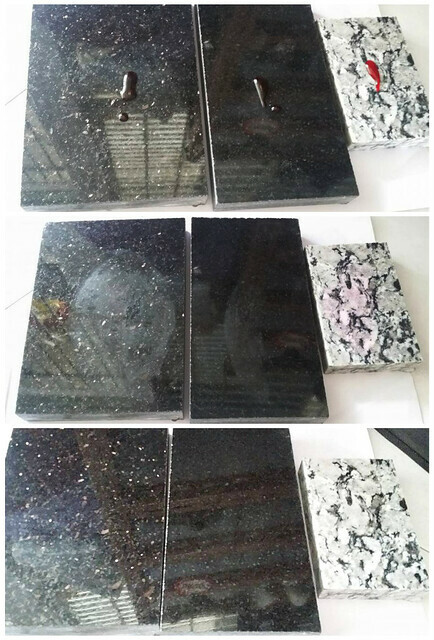 From this it seems to make more practical sense to go dark if opting for granite. This is the result after leaving red wine on for 10 minutes before wiping off and cleaning with dish-washing detergent. Ceaserstone (middle sample) is obviously stained. Carol mentioned that both Eurostone and Granite are not stained. However, I feel that it looks like the Eurostone is stained as well. Seems to me like only the granite took the red wine stain better. Carol mentioned that she used quite a bit of strength in order to scratch the samples. 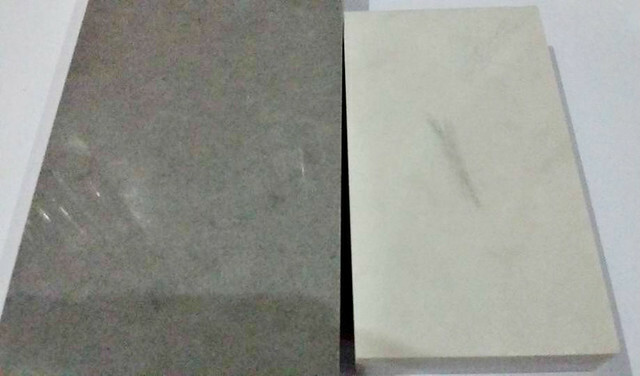 Both the quartz samples do not fair well against scratches but the scratches are less obvious on the Eurostone samples because of the bling. Granite is much harder to scratch according to Carol. 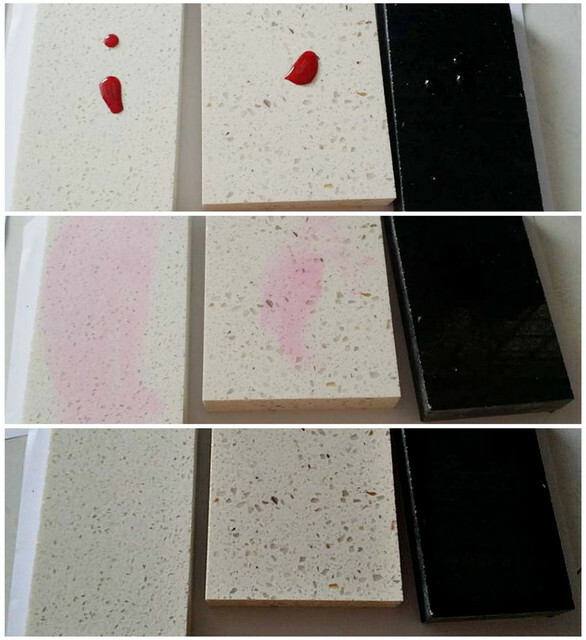 Carol said that it was hard enough to scratch all the samples, so she did not do the chip test. Chipping is unlikely in her opinion, unless you drop a heavy object such as a hammer on the countertop. No photos provided but Carol told us that the result of her heat test is that all the samples did not wrap or stain. She mentioned that she poured hot water over them too and they were perfectly fine. However, granite seemed to disperse heat better than quartz. What do you think about this abuse test? 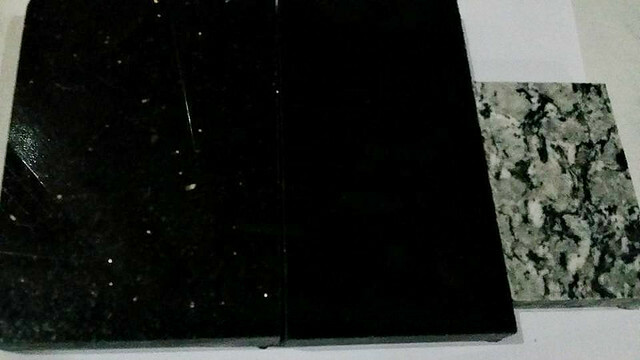 I was previously looking to get a plain quartz that is close to a wood colour for our kitchen countertop, but my preliminary thoughts from this test is that maybe plain coloured quartz is not such a good idea after all, especially since I’m a klutz always knocking things over. 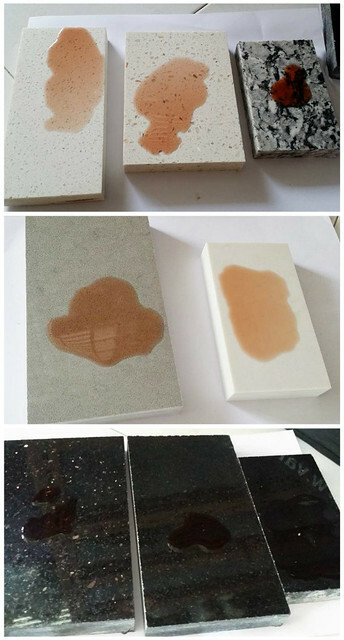 I am arranging to obtain samples of kitchen countertop materials to abuse. 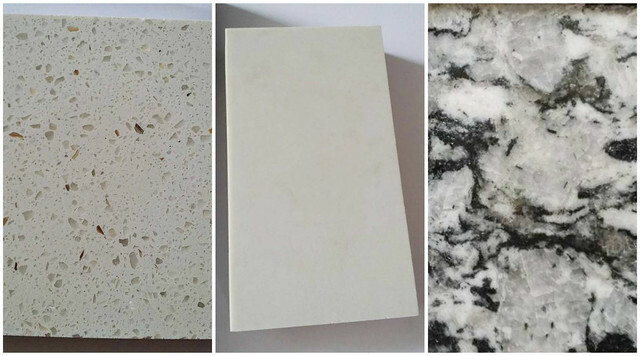 Materials I’m looking to obtain are quartz, granite, kompac plus and butcher block. I’ll write about it in August, check back to see the results! Disclosure: Carol has indicated that she does not receive any form of compensation for conducting these abuse test. They were merely done for her own information and shared with neighbours for information as well. I receive nothing for writing this as well! Just wondering which was the supplier for the light coloured granite is from? It’s my neighbour’s supplier, I’ll ask her and let you know! 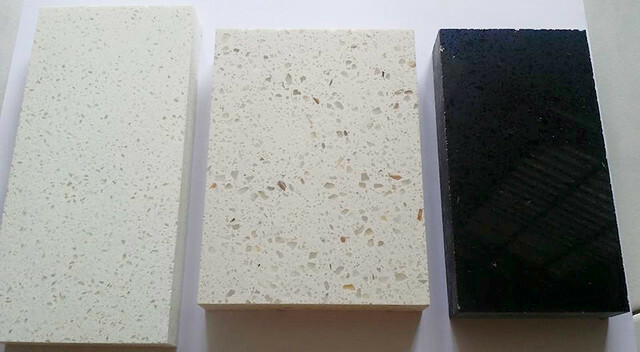 So which material did u decide on for your kitchen top? I used a white quartz! We used caesarstone in the end! Slight problem with staining, but no chipping issues!